The sun is sinking low, and Sleepytown is ready to say, "Night night!" 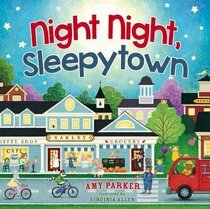 Join bestselling author Amy Parker and award-winning illustrator Virginia Allyn in the latest Night Night adventure through Sleepytown, the charming little village where residents are drifting off to dreamland, just like your little one is sure to do. Sleep may come slowly for many toddlers, and Night Night, Sleepytown is just the cozy story to help your little one nod off for the evening. Even the most stubborn bedtime resisters will love this delightful board book full of fun and silly characters who are getting ready for sleepy time in Sleepytown. Amy Parker and Virginia Allyn, the same award-winning pair behind the bestselling books Night Night, Farm and Night Night, Train, team up again for this brand-new story that is equally appealing for little boys and little girls. Complete your collection with Night Night, Sleepytown today! About "Night Night, Sleepytown (Night, Night Series)"